The holographic image of Tupac Shakur originally seen at Coachella Valley Music & Arts Festival on Sunday, may end up on tour with other rappers. 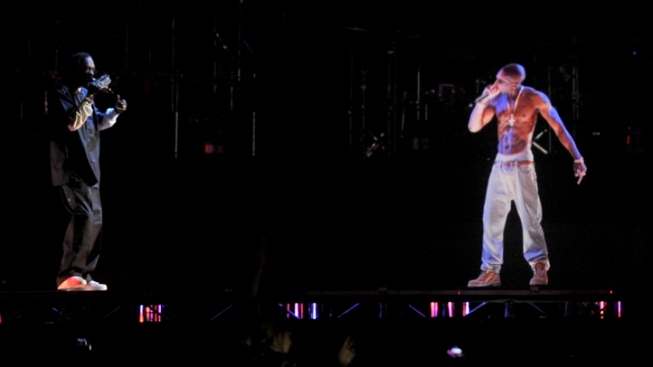 The hologram that showed the late Tupac Shakur performing at the Coachella Valley Music and Arts Festival on Sunday has the approval of his mother, Afeni Shakur. Originally garnering mixed reviews, a rep for Shakur’s mother told TMZ she was “absolutely positively thrilled” with the hologram. This may just be the beginning of the hologram’s lifespan, as both Dr. Dre and Snoop Dogg have ideas to incorporate it into future concerts. The Wall Street Journal reported that the virtual Tupac may even interact with other acts while on stage. "This is just the beginning," Ed Ulbrich, Chief Creative Officer for Digital Domain, which produced the virtual Tupac, told the WSJ. "Dre has a massive vision for this."